yes its a bit shocking really.... and the forces required to flex that far are about 4 tons in the 628 engine. Fascinating. Thank you all for this incredibly deep and useful information. This thread has already linked what tatters of knowledge I had previously accumulated, and will help in learning more. Glad to have you back by the way Bushie. 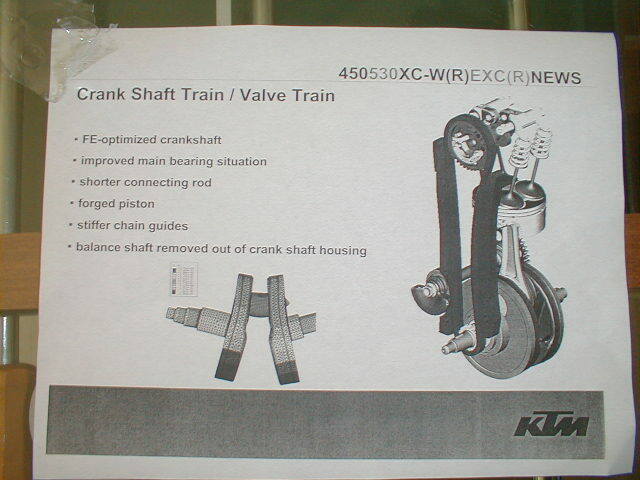 "balancer removed from crank housing"
I asked on KTMtalk if anyone had seem a picture of a failed NTN NJ206 .. nobody has and that covers at least 1000 builds between the main builders there. All the pictures of failures are with the SKF bearings.. AFAIK Orangeberg hasn't had any of his NTNs fail either that is not to say that the NTN Nj206 is indestructible just that it is substantially better than the SKF. Improved bearing situation = 207's, eliminating the balancer removes two joins and a "sleeve"
I would like to know what an "FE-optimised" crank amounts to. I really need to measure my crank now that it is back in the cases Bugger.... Wouldn't take long to dig it out. I think my rod is 132mm ? Is this right, I sent you the specs sometime. Stiffer chain guide was offset by weaker adjuster. Wow you guys have been getting around on cast pistons is that correct ? Was it the aim to stiffen up the drive side ? I know nothing about the last generation of motors, the primary gear on the 570 is a very tight 120 nm torque setting, ( left hand thread) taper fit with added factory loctite. I guess the cycling of drive, coast and engine braking would really set things off as well. I see that you have added extra stuff to the drive side of your Frankenmotor. Is tolerance to axial and angular forces the drive ( pardon the pun ) running a ball roller combinaton. As an act of faith my fancy pants ldc has gone back together on the tightest .09 mm axial clearance. I hate to compare apples to oranges, I just would really like to quantify the changes that have been claimed by ktm. Interesting. could somebody insert the conrod dimensions (lenght C to C, width, diameters of upper and lower eye) of most common models e.g. : 400, 501, 600, 450, 550, 650? So one could have better idea about the stiffness fighting the spreading forces. thanks in advance. one cant find all this info in tunning section. sounds like i've had this happen to my 650 engine, the flywheel side is 0.05mm out just outside the woodruff slot. That side bearing is a pretty tight push fit on the crank but the balancer side needs a bit of a knock. I've stripped the engine as it had developed a bad vibration between 4-5000 rpm (on the street with sm tyres) it does seem to smooth out over 5000. Is it pretty straightforward for a good engineering shop to straighten it back up? 6206 bearings used and pretty sure the axial float was 0.4mm. yes the info you sent me on the 570 rod is .... centre to center is 120.8 **edit is that right ? seems very short**** and small end is 20mm the big end pin is 35 od and 62.7 long weighs 394g the big end is 42mm id and 19.90 thick with a 19.70 thick bearing cage. the NJ207 has a 35mm ID vs the 30mm of the old engines so the idea behind the change Is to stiffen the crank and put both mainbearings closer to the webs reducing deflection even more. your axial play is very tight but if the crank is stiff enough the axial loads on the rollers isn't very high .... obviously it works. what is the factory axial crank play spec for the 570 ? i put the fancy spherical roller on the drive side simply because the drive side roller always showed more signs of wear than the ignition side. the ignition side NTN Nj206 bearing i got off Orangeberg years ago still looks brand new so i left it but still run 0.8mm axial play since half the axial loading is taken by each bearing. the drive side obviously has more radial loading than the ignition side and i noticed more wear when i went to the 105mm bore so I think radial load plus axial load plus misalignment from flex are the reasons the drive side bearing cops more abuse. with 0.05 measured like that you would probably see 0.1 runout between centers which is really not bad at all .. most cranks would measure that after the first time you rev the bike out. it might be twisted on the pin slightly which doesn't show up as the same kind of run out.